Location is the best for this two bedroom townhome just minutes from the historic Santa Fe Plaza as well as Canyon Road. This light and bright home boasts high ceilings with classic vigas, Mexican tile and brick floors! The living room with Kiva fireplace is inviting and opens to the dining/kitchen with stainless steel appliances. The Southwestern décor and beautiful art collection most definitely gives the feel of being in Santa Fe! The living room offers a flat screen TV, leather sofa and comfy chairs to curl up and read a good book! The dining room with beamed ceiling is comfortably furnished adjacent to the kitchen as well as the patio for outdoor dining during the summer months. From the French doors, you will find table and chairs to enjoy the crisp mountain air. kitchen is appointed to enjoy your morning coffee or prepare a traditional Thanksgiving dinner. Upstairs is the master suite loft with new floors and a queen size bed and TV. You will have sweet dreams when you retire for the evening gazing up at the beautiful and classic viga ceiling. There is a window seat allowing plenty of light. In addition, there is a full private, master bath. There is a balcony accessible from the master suite. It has an outdoor fireplace which makes a great spot to relax on a cool summer night. The guest bedroom and bath are located off the kitchen. This bedroom has a queen bed and TV as well. Both bathrooms are full baths with shower/tubs. 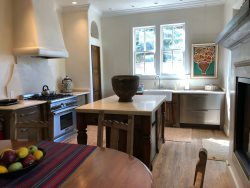 This is a perfect spot for two couples wanting to spend some time together or for a family of four who enjoy close proximity to downtown Santa Fe. There are a bevy of galleries, restaurants and shops within minutes of Alameda Loft. is assigned parking for one car and additional, short term parking for guests. The owner may consider a well-behaved dog. Cats are not permitted. Minimum night stay may be required during peak seasons.